Available from Iseki Australia , SZ330 Zero-Turn lawn mowers are reliable, hard-working and specifically designed with the professional operator in mind. Offering advanced engineering, SZ330 Zero-Turn lawn mowers ensure a smooth ride, offering comfort to the user when operating the equipment for extended periods of time. SZ330 Zero-Turn mowers feature a powerful and fuel efficient 33hp Iseki diesel engine and have cutting width of 1830mm and an easily adjustable cutting height of 25mm to 115mm, enabling them to handle big jobs with ease. Their large radiator and cooling system also means they are suited to harsh Australian Conditions. 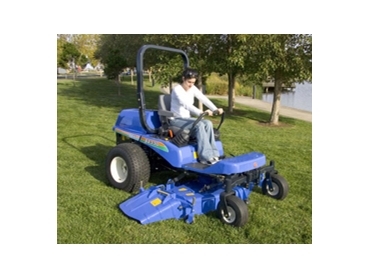 This model lawn mower features a folding ROPS frame as standard and a deck lift and jack mechanism so that the mower’s front end can be easily raised. SZ330 Zero-Turn grass cutters also feature ergonomically grouped controls and instruments, facilitating easy operation. The fully opening hood and a folding seat also assist with easy servicing and maintenance.